Inner Banks Living has a special offering of only four, one acre homesites along Lake Mattamuskeet. This is a very special chance for you, and here’s why. 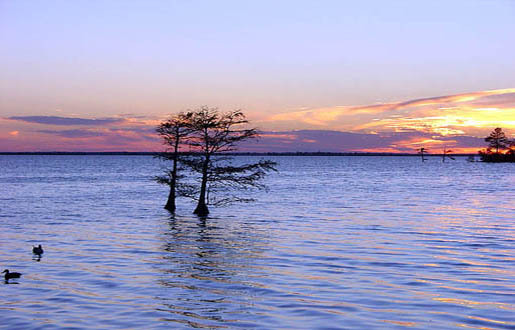 North Carolina’s preeminent lake is Lake Mattamuskeet. It’s is the state’s largest natural lake with 40,000 acres of open waters. Lake Mattamuskeet is the wintering home for thousands of canadian geese, now geese and tundra swans. In days gone by Lake Mattamuskeet was regarded as the “Canada Goose Hunting Capitol of the World”. Bald eagles and peregrine falcons are residents of the Lake as well as a multitude of ducks, osprey and shore birds. The waters of Lake Mattamuskeet hold a very diverse population of aquatic species. Freshwater fish such as largemouth bass, perch, crappie, alewives and brim are in abundance. But Lake Mattamuskeet is also famous for its blue crabs and occasional catch of flounder. For the hunter, the Lake Mattamuskeet Wildlife Refuge hosts a waterfowl and deer hunt. Permits are issued each year by lottery. As a side note, the entire Inner Banks is teeming with white-tailed deer, rabbits, squirrels, turkey and other game.